At this price point, the Horizon Elite T7’s main competitor is the NordicTrack Commercial 1750 and it really doesn’t stand a chance if you compare the two models side-by-side. If Horizon would lower their price point on this machine, then they would have a leg to stand on. Without knowing anything about this treadmill, I would have guessed it was priced somewhere around $1,000. Needless to say, I was surprised to learn that on SALE, it sells for $1,499. 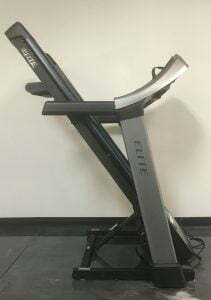 The Elite T7 is a super simple treadmill. It has a small frame and a low sitting console. The belt speed is normal and consistent and fairly quiet compared to its competitors. There are minimal options for use with this machine which is great for someone who wants something very simple and light on the tech. 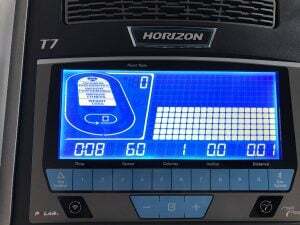 The Horizon Elite T7 sits in the $1,500 category for treadmills. Other treadmills in this same price range include the NordicTrack 1750, the Sole F80, and ProForm 5000. You can typically buy this treadmill for about $1,499. Jog, run, or walk occasionally. Want a small, foldable, space saving frame. Want a simpler machine with less tech/options to choose from, less to look at on their console (I wouldn’t say ‘simplified’ because the learning curve for this machines tech wasn’t exactly self-explanatory). 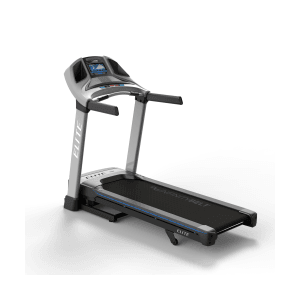 For treadmills in the price range, the Elite T7 falls just short of it’s competitors. This machine works, it’s capable of providing a comfortable running surface and saving loads of space in your home. It’s easy to move around and it’s good for the user who desires less tech in their treadmill. But for the same price, you can have many more features, a larger (stronger) motor, and better data tracking if you consider a different make/model treadmill. Treadmill Best For: Walkers and casual joggers. Motor Size - This treadmill has a smaller sized motor than others in this price range. For example, the NordicTrack 1750 ($1500) comes with a 3.8 CHP motor which is significantly larger than the T7’s 2.75 CHP. So if you’re looking to get a lot of fast-paced mileage out of your home treadmill, you might want to consider something other than the Elite T7; however, if you’re looking to do light jogging (5-10 miles a week) or primarily walking, the smaller motor wont be much of an issue. It also comes with a lifetime warranty. 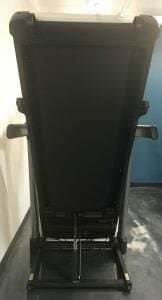 Running Surface - 20” x 60” is a standard size for a treadmill belt. Larger belts rarely go above 22” x 60”. So unless you have wider-than-average stance, you’ll be fine with this size running surface. Weight Capacity - The T7’s 350 lb weight capacity is pretty standard. Folding Capability - This treadmill folds nicely. With the hydraulic used to raise and lower the tread, you don’t have to be very strong to fold it up. The release is near the bottom of the treadmill, on top of the hydraulic. By pressing the silver tab with your foot, the hydraulic releases and lowers the tread deck slowly to the floor. Space / Footprint - This is a small machine which is a great selling point! It doesn’t require a lot of space in your living room, home gym, or wherever you’re trying to stuff it. It also moves pretty easily on its own so this is a treadmill you can easily slide into a closet when you aren’t using it. 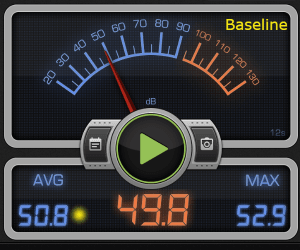 Noise Level - The average level of noise in the room before testing the noise output of the T7 was an average of 50.8 db. 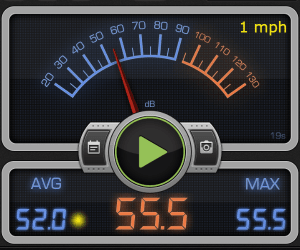 The noise output was then tested for the T7 at 1, 6, and 12 mph with the fans on. The fans hardly make a difference in noise output whether they’re on or off. That’s probably due to the fact that they put out very little wind. The controls make a loud beep when you press any of the buttons. This is something that cannot be muted or channeled through your headphones. 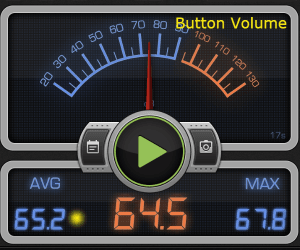 Their noise output was an average of 65.2 db. 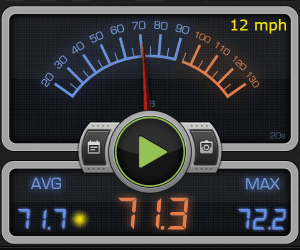 Max Speed - The Elite T7’s max speed is 12 mph. 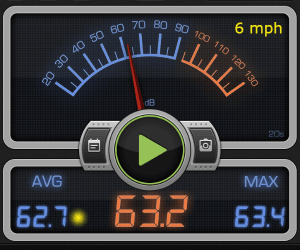 This is a standard max speed for most treadmills. 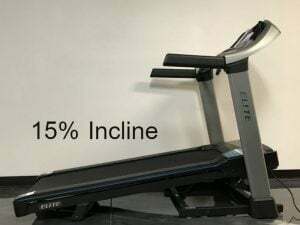 Other treadmills in the price range have the same max speed.Incline - This treadmill has an incline range of 0% to 15% - very typical for a treadmill; however, other treadmills in this same price range offer a decline setting. The incline adjustment is comparable to those on other treadmills in this price range (speed and noise level). The controls for the T7 are simple, yet they aren’t as self-explanatory as one would assume. Speed Adjust - If you only push a number, it doesn’t change anything (speed or incline). 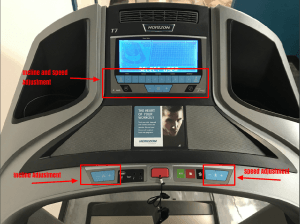 You have to push a sequence of at least 3 buttons to successfully change your speed or incline during your run - unless you toggle endlessly with the (-/+) buttons and in that case you’ll be pushing a lot more buttons to change your speed/incline. This seems like something silly for a reviewer to throw a fit over, but if you’re mid run and having to fuss over all of these buttons, it’s pretty disruptive. It becomes a much larger nuisance if you’re attempting timed tabata, HIIT, or sprints. Of all the treadmills in this price range, the T7’s interface is the least user friendly. 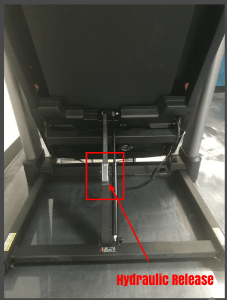 Incline Adjust - If you hit “4” the screen will display “0.4”, then hit set incline, the incline will set to the nearest .5 - so in this case the screen will display “0.5” and the incline will adjust to 0.5. 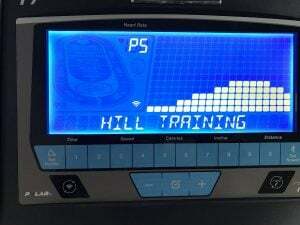 If you hit “9” and “set Incline”, the screen will read “1.0” and set the incline to 1.0. 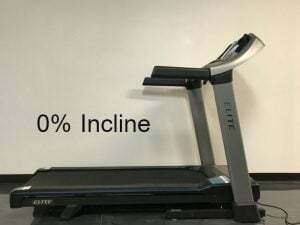 If you hit “6” and “set incline” the screen will read “0.5” and adjust incline to 0.5. To be honest, I still haven’t figured out a way to smoothly change speed and incline during a workout. Each time I’ve used this treadmill, I’ve been a bit baffled by these controls. Depending on personal preferences, you’re going to love or hate the fact that there is hardly anything complex about this treadmill. Considering what you’re getting for a $1500 purchase, we feel that you aren’t getting your money’s worth out of the T7. Especially when you compare it to other treadmills at this price point. PreInstalled Workout Apps: 13 workout options including 2 custom settings, 1 calorie workout, 1 distance workout, 4 interval workouts, 3 performance workout, 1 step count workout, and the manual setting. Distance - Set distance (by whole mile), speed, and go. Displays a chart to show you your progress. Calories - Set calorie goal (by 100’s), speed, incline, and go. Intervals - Select speed, endurance, peak, or heart rate targeted intervals. The program will ask for specific parameters like speed, distance, max incline, etc and then take you through the workout. Performance - Select run/walk, hill training, or sprints. The program will ask for specific parameters like speed, distance, max incline, etc and then take you through the workout. Steps - Select steps goal (1000 to 10k by the thousands), set speed and incline and press start. Each of these workouts require programming by the user (setting the parameters one step at a time) before hitting start. This isn’t unusual for a treadmill workout app. But if you get through a few parameters and want to go back and change any of your settings, you can’t hit a “back” button and simply edit your selection. You have to back out of the program completely, all the way back to the home screen and start from scratch by selecting a user, selecting a program, setting parameters, etc. To say the least, this is annoying. Combined with the oddity of the speed and incline adjustments, the T7’s programming is not very user-friendly. 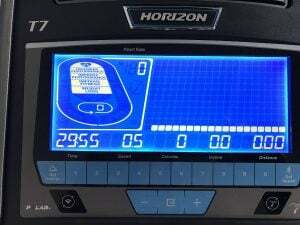 8.5” LCD Backlit Display - It’s hard not to compare the Elite T7 to the NordicTrack 1750 because you’re paying the same amount for both treadmills and getting so little from the T7. The 1750 comes with a touchscreen that’s easy to navigate and read. With the T7, it’s very basic, slightly confusing, and the backlit display makes it harder to read. Speakers - These speakers work just fine and produce a good amount of sound. They will project sound from an external device by plugging your phone/tablet/mp3 player into the provided audio jack. Similarly to the Sole F80 and F63, there is a headphone jack but we still don’t understand why you would want this feature in a treadmill if the treadmill isn’t offering it’s own source of audio entertainment. You could simply plug your headphones directly into your music playing device. I wish that using the headphone jack would at least channel the annoying and loud beep made by pushing the treadmill controls through the headphones but it does not. Workout Fans - There are two small fans inside of one adjustable output. No matter your height, these fans don’t put out enough gust to make a difference. If you’re taller than 5’7”, you might feel a breeze on your chest. But it will not reach your face. As I’m 5’7”, I had to lean very close to the fan to feel relief from it. Then, when I leaned in close, I constantly tripped on the front belt cover. These fans are worthless. Pretend the Elite T7 doesn’t come with fans. Bluetooth Heart Rate Monitor - You have the option of using the hand rails or the free chest strap by polar. Typically we love polar hear rate monitoring technology but this free chest strap takes a minute of two to catch on and give an accurate read. This will affect the treadmills calculation of accurate calories burned but not enough to really skew your data tracking. Cushioning - The Horizon Elite T7 offers Variable Response ™ Cushioning. It is more comfortable than running on concrete! It’s hard to give you a solid rating for cushioning because some people love it and some people hate it. I will say that it’s on the lesser side of cushioning when compared to other treadmills; but this is a good thing for runners wanting to stay conditioned for outdoor running. This treadmill is a very basic, little fuss, hop-on-and-run kind of treadmill. If this sounds like something you’re interested in, then great! If you’re looking for more entertainment, more workout apps, and better data tracking, read our review of the NordicTrack 1750. Warranties - Lifetime for frame and motor; 5 years for cushioning and parts; 1 year for labor. Customer Support -Horizon offers “How To” videos and plenty of online manuals for troubleshooting or you can call them directly 800.244.4192. Return Policy - 30 day guarantee - full product refund OR credit. They do not refund the return freight or assembly charges. Expect to have to pay fees on top of your return, especially if it’s outside of the first 30 days. 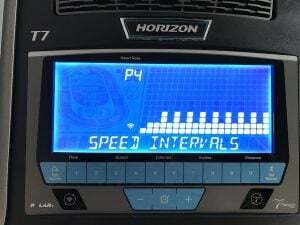 The Elite T7 by Horizon is a surprisingly sturdy machine, especially when you consider how light the treadmill is and it’s folding capability. This is one of the T7’s best selling qualities. The belt raises and lowers easily. The treadmill feels very sturdy when it’s in use. The assembly was hassle free. They also offer a comparable warranty to other treadmills in the price point. These are the many reasons why we gave the T7 a great score for overall build quality. This machine is not worth the investment. If your budget is in this price range, you’ll get a better bang for your buck with a different treadmill. The NordicTrack 1750 is packed full of tech features, has a stronger motor, but takes up more visual space. If you want something that is less eye catching and similar to the T7, try looking at the Sole F80. Almost always, we recommend that consumers buy directly from the manufacturer, as that saves money and gives you access to the latest models. You’ll have the least hassle of dealing with returns and customer service this way as well.